This paper seeks to examine the views and perceptions of the faculty at the Arthur Lok Jack Graduate School of Business on moving into an environment of blended learning. A survey was administered to a cross-section of faculty members to gain their perceptions on the institution’s move towards blended learning. The results will inform the strategic direction and choices of the institution in its thrust towards blended learning. The results indicated that while faculty members generally viewed blended learning positively, there were some areas of concern that must be addressed in order to ensure successful implementation. One area that has experienced phenomenal changes as a result of the use of Internet technology is the area of education. The concept of ‘e-learning’ is facilitating the teaching and learning experience through new channels and technologies. The education lexicon has grown in this context to include terms such as ‘virtual classroom’, ‘web-based learning’, ‘online learning’, ‘distance learning’ and ‘blended learning’, among others. While they all refer to the same concept, many overlaps can be seen within these terms. Urdan and Weggen (2000), for instance, found that online learning constitutes just one part of e-learning. They further define it as learning processes that take place via the Internet and in blended classroom contexts. They specified that e-learning covers a wide spectrum of applications and processes, including virtual classrooms and digital collaboration. In whatever way it is defined, e-learning has grown in popularity in a very short space of time. Spender (2001), asserts that e-learning is the next generation of learning because of its flexibility. In a national survey of chief academic officers, Allen & Seaman (2004, quoted in Bonk and Kim 2006, p. 23), reported that 52.6% viewed online learning as critical to their institution’s overall long-term strategy. That same survey reported that a majority of all American colleges and universities were offering full online courses enrolling approximately 2 million students. In public sector institutions, especially where increasing student access to education is an important part of their missions, the percentage offering online courses was as high as 90%. In this region the University of the West Indies has been at the forefront in pioneering the use of e-learning in the English speaking Caribbean. The University of the West Indies Open Campus offers undergraduate degree programmes using blended learning. The Arthur Lok Jack School of Business has launched its e-learning platform but is only now in the process of contemplating the use of blended learning. It is within this context that the aim of this paper is to examine the perceptions of the members of the faculty of the Arthur Lok Jack Graduate School of Business on the use of blended learning in the academic programmes. Garrison and Vaughn (2008) describe the basic principle of blended learning as a situation where face-to-face oral communication and the online written communication are optimally integrated in such a way that the strengths of each are blended into a unique learning experience congruent with the context and intended educational purpose. For the purposes of this paper, blended learning is seen as the integration of a variety of technological delivery methods with the traditional face-to-face classroom activities thus facilitating the use of asynchronous methods in the process of teaching and learning. The Arthur Lok Jack Graduate School of Business (formerly the UWI-Institute of Business) was established in 1989 as a joint venture between the University of the West Indies and the private sector of Trinidad and Tobago to provide postgraduate education in business and management. The school is recognized as being at the forefront in the provision of business and management education, professional training and consultancy services in Trinidad and Tobago and the wider Caribbean region. The faculty is comprised largely of adjunct staff from industry and government. The move towards e-learning has been slow since high levels of face-to-face interaction is seen as a major strength in attracting students to the institute. However, the growth of the student body over the past two years and the number of students attending classes during working hours per week, have put a strain on the physical capacity of the institution in terms of classroom space. To help alleviate this problem management has sought to hasten the move towards the use of blended learning. To this end, the perception of faculty is a critical factor that can affect the process. Jarlan (2004) asserts that “buy-in” from teachers is essential. Put simply, even though there is a recognized need for increased access, e-learning technologies cannot be used effectively without the full support of those who will use them (for instance, faculty and staff). Teachers must take the initiative to transition away from traditional methods of teaching, towards a more constructivist pedagogy that will enable students to derive full benefit from e-learning (O’Donnell, 1991). A questionnaire was administered to members of faculty during the period December 2008 and February 2009. The questionnaire had a preamble and three main sections. The preamble outlined the school’s move towards using online technology in programme delivery and gave a brief description of blended learning. 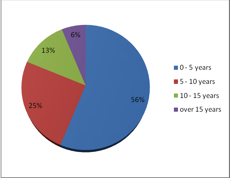 The first section captured data on number of years the respondent had been a member of faculty, the subject area group to which the faculty member belonged and whether they presently use Lok Jack e-learning. In the second section, faculty rated a series of statements on blended learning on a five point Likert scale, with 1 being ‘strongly disagree’ and 5 being ‘strongly agree’. In the final section, respondents were given the option to express their views on perceived advantages and general concerns which they had on the move towards blended learning. A total of 70 questionnaires were given out to a random selection of faculty members and a total 32 usable responses were received. The graphs in figure 1 and 2 show the breakdown of the responses in terms of subject area group and years as a member of faculty. 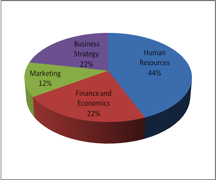 As can be seen from Figure 1, 44% of the responses were from Human Resources, while Finance and Economics and Business Strategy had 22% each and Marketing 12%. In terms of years of service, Figure 2 shows that just over 75% of the respondents had less than 10 years service with the institution. Do you use Lok Jack e-learning ? Previous experience in online teaching? As can be seen from Table 1, only 33% of the staff uses the present e-learning system in the delivery of their course. The use of the e-learning system is mostly limited to posting of readings and lecture material. There were very few instances of online assignment submission and online discussion forums. It was notable however that 60% of the respondents had previous experience in online teaching. This suggests that the school needs to do more to encourage its faculty members to use the online mode. Table 2 gives the results of how faculty members perceive blended learning based on a series of 17 statements, which they were asked to rate on a 5-point scale. Overall faculty members held a positive view of blended learning. The relatively small standard deviation indicates that respondents generally held similar views. The results indicate that faculty saw blended learning as enriching the learning experience and saving time and money. However, they tended to see it as reducing teamwork and collaboration amongst students and were also unsure as to whether blended learning would cause loss in learning consistency due to fragmentation. While they were mostly convinced that it would be easy to monitor teaching and learning processes, they were unsure as to how difficult it would be to monitor the evaluation and assessment processes. Research suggests however that the online environment does support teamwork development and collaboration (Harasim 1995, Kemp 2006). Also, Aycock, Garnham, & Kaleta (2002) emphasize that faculty development stresses the integration of “online material with face to face interaction so there aren’t two courses.” In terms of assessment, the question of monitoring has to do with ensuring that the students themselves undertake the evaluation exercise. The extent of dishonesty however, could be mitigated by the design of the assessment methods. There is evidence that on-line assessment, unless carefully planned, can encourage students to focus on lower level cognitive skills. The educational effectiveness of on-line assessment that concentrates primarily or exclusively on true/false or multiple choice responses, for example, is highly questionable in a higher education environment (Delvin 2002). In a study of pedagogical practices, Bonk (2001) found that only 23–45 percent of online instructors surveyed actually used online activities related to critical and creative thinking, hands-on performances, interactive labs, data analysis, and scientific simulationsalthough 40 percent of the participants said those activities were highly important in online learning environments. There is strong indication that the faculty members believe they need to be trained in the technical aspects of the course management software and in course design and delivery. The need for training is seen as most important for the success of blended learning (Ranjan 2007). Mason (2001) recommends comprehensive staff training initiatives that allow those involved to become proficient in the technical and educational aspects of e-learning. Training initiatives must integrate “learning about educational design” with hands-on “learning how to use the technological devices and tools” to teach. Teachers therefore must be encouraged to become active participants in the design and implementation of e-learning processes, instead of having it imposed upon them. Faculty members also strongly believe that lecturers would need to have well prepared online material, which would need to be standardized and that a variety of teaching methods must be employed. Kim and Bonk (2006) indicate that planning and moderating skills are perhaps more important than actual “teaching” or “lecturing” skills in online courses. They contend that “online instructors during the next few years would need to know how to moderate or facilitate learning and how to develop or plan for high-quality online courses. Being a subject-matter expert was the next most important skill.” This is a critical point for the Lok Jack School of Business since the choice of faculty is largely determined by subject expertise and industry experience. Faculty also saw the need to have the school improve its technological infrastructure to properly support blended learning. It was encouraging to note that faculty did not perceive that the move towards blended learning would affect the school’s ability to attract students and that it would not be difficult to adapt their courses for the blended learning environment. These latter results can be interpreted as a positive sign of ‘buy-in’ from faculty members in moving towards blended learning. The results of this survey provide useful insights in shaping how the Lok Jack School of Business moves forward in enabling blended learning. The results point to critical success factors such as the need for training and a dependable IT infrastructure, and allowing for the identification of perceptual gaps. These perceptual gaps exist where faculty members’ perceptions differ from the pedagogical expectation of the institution in using blended learning, based on existing research and best practice. This was noted in the faculty members’ perception of online delivery with regards to teamwork and collaboration, integration and assessment. It is significant however that the faculty members underscored the need for training and development as this is critical in gaining alignment in the perceptual gaps and building confidence. Training and development opportunities can also serve as a catalyst for involving faculty members in course designing and planning so as to pave the way for their “buy in”. Starenko M.(2008). “Reflections on Blended Learning: Rethinking the Classroom”.Rochester Institute of Technology, pp 3. Harasim, L. M. (1989). “Online Education: An Environment for Collaboration and Intellectual Amplification”. Quoted in L. M. Harasim (Ed. ), “Online Education: Perspectives on a New Environment”. New York: Praeger, pp. 39-64. Kemp, L. J. (2006). “Learning about Teamwork in an Online Study Environment”.MERLOT Journal of Online Learning and Teaching. Vol 2. No. 1, pp 30 – 41. O’Donnell, J. (1991). “Teacher Perception of Their e-learning Needs to Integrate e-learning into Classroom Instruction”. Unpublished doctoral dissertation, University of Southern California at Los Angeles. Quoted in: Jamlan M. (2004). “Towards Introducing e-learning at the University of Bahrain”.The International Review of Research in Open and Distance Learning, Vol 5, No 2. Urdan, T. & Weggen,C. (2000).”Corporate e-learning Exploring. A New Frontier”. Computer News, 53(11), pp 35 – 36.